It is imperative that BioBricks submitted to the parts registry are well characterised, but we noticed that experiments previously done for binding cells to surfaces are very qualitative, they will highlight the presence of cells but there is no ability to draw comparisons or conclusions beyond that. As a means of really characterising our Aggregation module well, we wanted to be able to quantify the strength of the binding that the cells containing our construct would be able to infer on the target plastics. We would need to expert some force on the cells and be able to measure this and the response of the organisms. Initial research suggested that the use of shear force would allow for our requirements, and so we consulted an expert in miniaturisation and shear from the Department of Biochemical Engineering as well as the Department of Biochemical and Chemical Engineering’s Rapid Design and Fabrication Facility (RDFF). 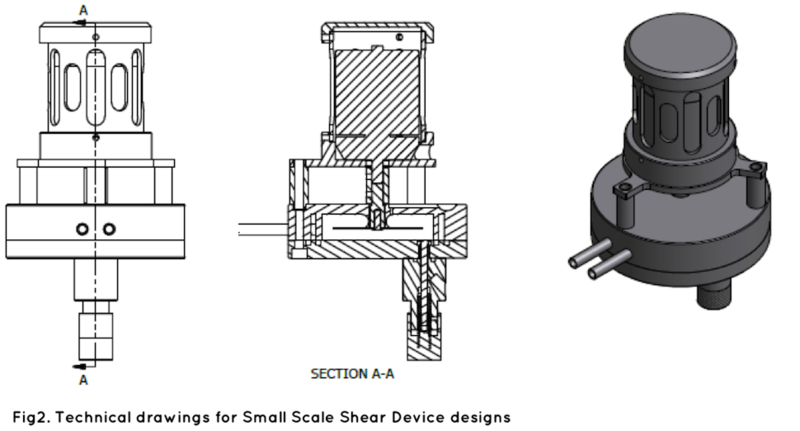 These fruitful sessions lead to the production of three preliminary design concepts (which can be seen as Fig.1a-c below). All 3 designs work on the principal of using a rotating head plate above a disc of plastic which has had cells adhered to it, to exert variable shear force across the surface of the disc. But all three have design and configurational differences which affect the mode of operation and how the magnitude of force is altered (further details are given for the chosen design below). Further research was conducted into the three crude designs with a view to whittling it down to a single candidate. This investigation focused on two main areas, firstly what work had been done previously, and therefore which of the devices would have available information from the literature. Additionally, and arguably more importantly what would be feasible based on the time constraints of the competition, the capabilities of the RDFF and the laboratories that were at our disposal. As mentioned above, this device has been designed on the principal of quantifying the adhesion between the cells containing our aggregation construct and the plastics which it targets. In the centre of the plastic disc, at a fixed rotational speed, there is a region of lower shear where cells remain attached to the surface. As you increase the distance from the centre of the disc the shear stress increases linearly (according to Eqn1. below), and so eventually the cells can no longer remain attached. 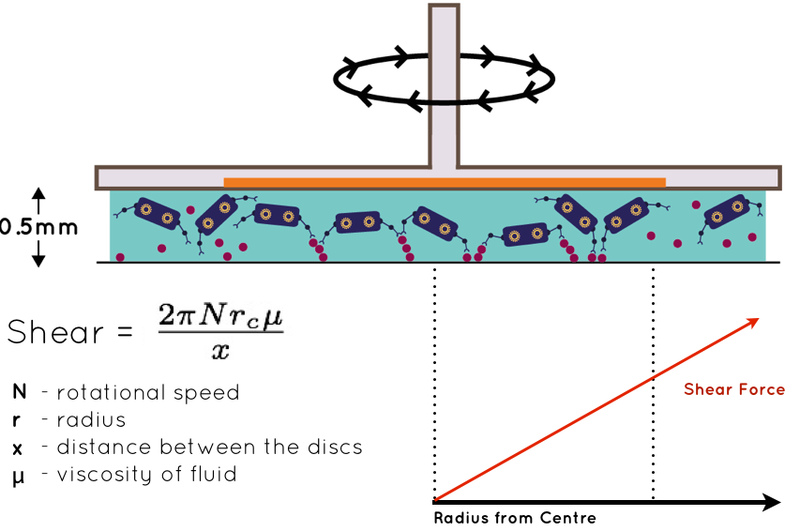 The interface between the two can be used to calculate a critical shear stress, the point at which the cells adhesive strength is outweighed by the shear being exerted. Currently the device pictured is under construction by the RDFF. We have carried out some work with a rudimentary version of the device (see video) as a means of proving the concept and highlighting the potential power of this new tool.